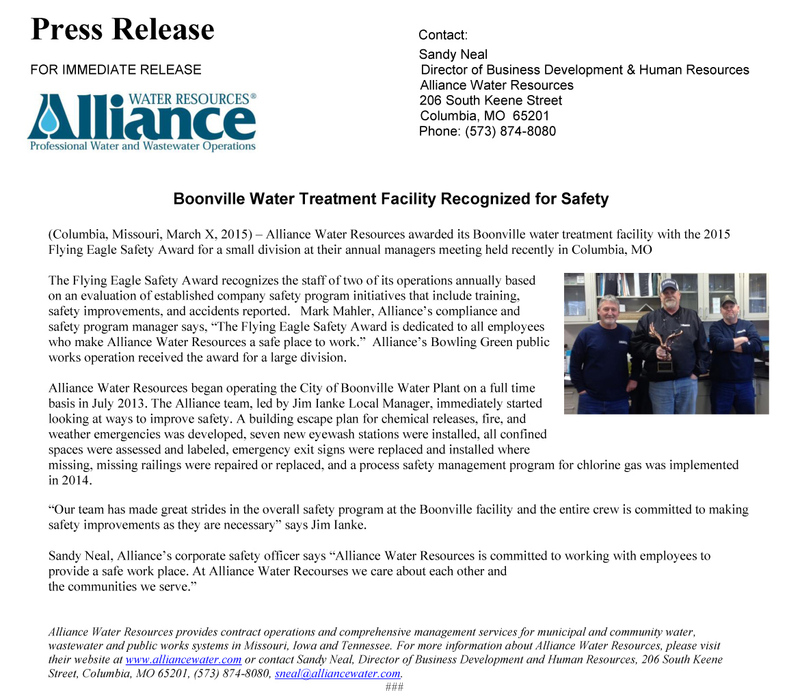 Alliance Water Resources awarded its Boonville water treatment facility with the 2015 Flying Eagle Safety Award for a small division at their annual managers meeting held recently in Columbia, MO. The Flying Eagle Safety Award recognizes the staff of two of its operations annually based on an evaluation of established company safety program initiatives that include training, safety improvements, and accidents reported. Mark Mahler, Alliance\'s compliance and safety program manager says, â€œThe Flying Eagle Safety Award is dedicated to all employees who make Alliance Water Resources a safe place to work.â€ Alliance\'s Bowling Green public works operation received the award for a large division.